A very big thank you to all the volunteers who have been out helping to deliver leaflets this week. 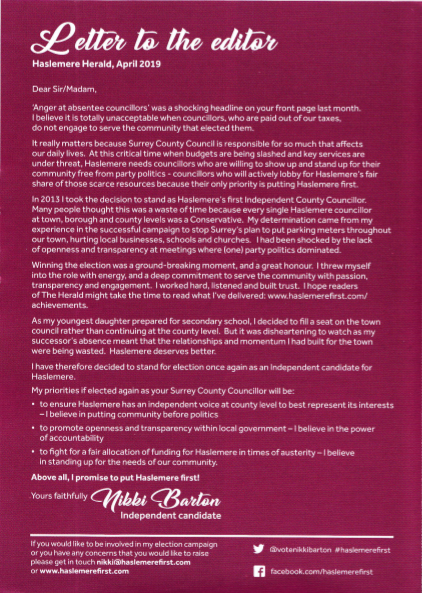 The back page of my leaflet is a copy of my letter here published in the Haslemere Herald. 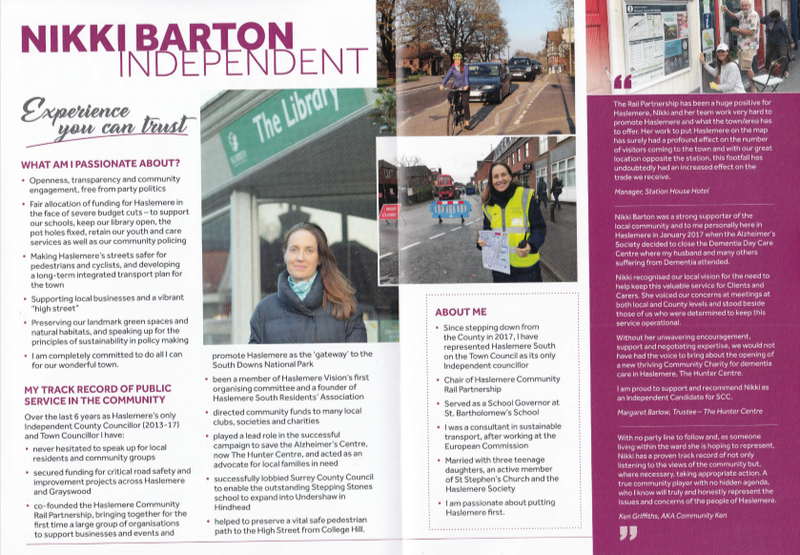 If you could deliver leaflets in the road where you live, please take a look at my campaign page here. This entry was posted in Haslemere first and tagged Haslemere, Haslemere first, Independent, LocalElections2019, Surrey County Council on April 11, 2019 by admin. 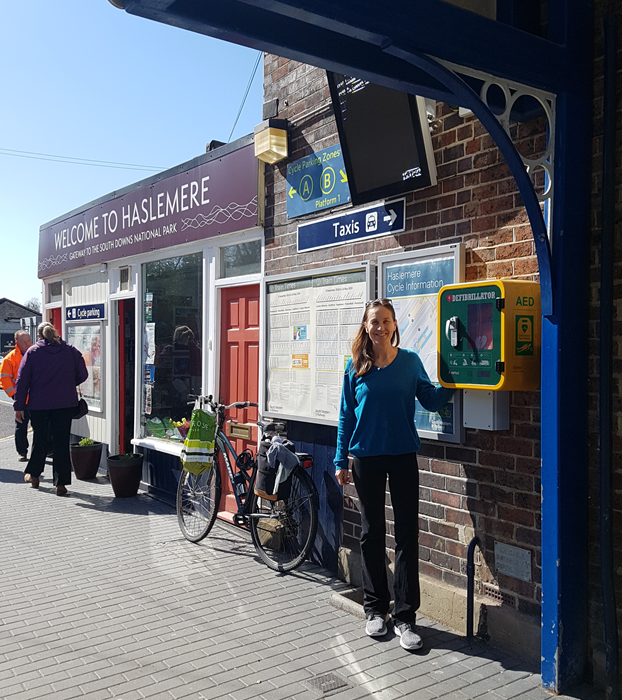 This entry was posted in Haslemere first and tagged Defibrillator, Haslemere, Haslemere Community Rail Partnership, Haslemere Information Hub, HaslemereToday, Independent on April 11, 2019 by admin. In the current edition of The Haslemere Herald, the paper published an article about a new public access defibrillator that has been installed on the station forecourt. Here is a link to the article online: Latest arrival a ‘lifesaver’ for town. This entry was posted in Haslemere first and tagged Haslemere, Haslemere Community Rail Partnership, Haslemere Herald, HaslemereToday, Independent, LocalElections2019 on April 8, 2019 by admin. My name is Nikki Barton and I moved to Haslemere South just over ten years ago with my young family, my three lovely daughters, and I quickly realised what a very special community it was. I’ve been very involved in the community over the years. I started a walking bus for St Bart’s schoolchildren to help them get to school more safely. I became a governor of St Bart’s School and then I discovered that Surrey County Council were planning to put parking meters throughout the High Street and along the other principle roads in his town. I led a successful challenge against that introduction of meters. I’ve also been involved with setting up the Haslemere Vision, the neighbourhood plan and I’ve also served for four years as the independent County Council for Haslemere. As Surrey County Councillor, I initiated quite a few projects around the town a key one was the Haslemere Community Rail Partnership which is set up at the station to try and promote the town and all the wonderful things that happen in the town and the countryside around. If I was elected to represent Haslemere South in the town council I would continue to champion Haslemere as I have done through my four years as an independent County Councillor. I’ve never been afraid to speak up for the town and pursue the principles of openness and transparency and community engagement. Another key concern for me is the scrutiny for finance at the Town Council level and also that we look at what we value in the town. There are several key issues that are of key concern at the moment for example traffic speeds and road safety in the town and that’s something very dear to my heart. We’re also facing some severe challenges with the loss of potentially both of our post offices, the closure of the Marjorie Gray dementia day care centre and the cuts really to some essential services. We lost our youth worker for example and I really feel that the Town Council could have a huge role to play in looking at some of those key issues. Looking again at that video, it’s a good moment to reflect on three proud successes for the community to celebrate. All were mentioned in that video two years ago. The dementia day care centre was saved and is now The Hunter Centre, still located on the Grayswood Road and the community post office that used to be located in The Coop was saved by the community and relocated to Haslewey. The Haslemere Community Rail Partnership has gained more recognition and is going to extend with the team’s help to other stations along the Portsmouth line. Please click on this link to read more testimonials. There are no constraints to being an Independent councillor. As long as you put Haslemere first, you can achieve great successes. I am planning to produce more videos for my 2019 campaign for the Surrey County Council and Haslemere Town Council elections. Would you like join my campaign? As an Independent, I have no party machine to fund or manage my campaign. Read here to see how you can help. This entry was posted in Haslemere first and tagged Elections, Haslemere Town Council, HaslemereToday, Independent, Surrey County Council, VoteIndy on April 5, 2019 by admin. My letter published in The Haslemere Herald announcing that I am standing as an Independent candidate in the Surrey County Council by-election on 2nd May 2019. ‘Anger at absentee councillors’ was a shocking headline on your front page last month. I believe it is totally unacceptable when councillors, who are paid out of our taxes, do not engage to serve the community that elected them. It really matters because Surrey County Council is responsible for so much that affects our daily lives. At this critical time when budgets are being slashed and key services are under threat, Haslemere needs councillors who are willing to show up and stand up for their community free from party politics – councillors who will actively lobby for Haslemere’s fair share of those scarce resources because their only priority is putting Haslemere first. In 2013 I took the decision to stand as Haslemere’s first Independent County Councillor. Many people thought this was a waste of time because every single Haslemere councillor at town, borough and county levels was a Conservative. My determination came from my experience in the successful campaign to stop Surrey’s plan to put parking meters throughout our town, hurting local businesses, schools and churches. I had been shocked by the lack of openness and transparency at meetings where (one) party politics dominated. Winning the election was a ground-breaking moment, and a great honour. I threw myself into the role with energy, and a deep commitment to serve the community with passion, transparency and engagement. I worked hard, listened and built trust. I hope readers of The Herald might take the time to read about my activities here: www.haslemerefirst.com/achievements. As my youngest daughter prepared for secondary school, I decided to fill a seat on the town council rather than continuing at the county level. But it was disheartening to watch as my successor’s absence meant that the relationships and momentum I had built for the town were being wasted. Haslemere deserves better. 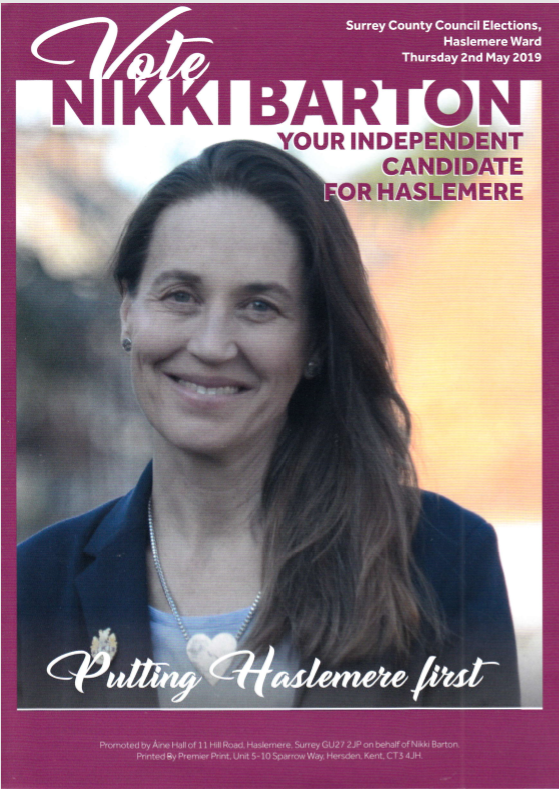 I have therefore decided to stand for election once again as an Independent candidate for Haslemere. Above all, I promise to put Haslemere first! This entry was posted in Haslemere first and tagged Election, Haslemere, HaslemereToday, Independent, Surrey County Council on April 4, 2019 by admin. Time’s running out! Register to vote now for the 2019 #LocalElections. This entry was posted in Election and tagged Haslemere, Haslemere Ward, HaslemereToday, Independent, Register To Vote, Surrey County Council on March 28, 2019 by admin. It’s been a very busy few days for us on the BBC Pandemic experiment. There have been a few technical problems with the BBC Pandemic app for some people but we’ve had loads of people taking part too. 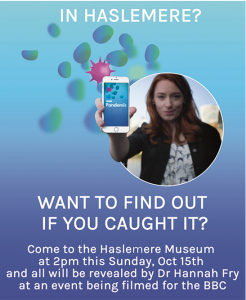 We are filming a results event tomorrow, 2pm at Haslemere Museum. Would it be possible for you to share this on your social media? Everyone in Haslemere is invited, particularly those people who did take part. It’s going to be exciting/nerve-wracking as I genuinely don’t know what the results will be. Like making live telly! And hopefully we’ll see you there too with family/friends if you’re free. Update: Technical problems have meant a few people are getting a message on the app today saying the tracker has stopped – but it’s okay, your data is good and you will still get your result tomorrow. As long as you don’t delete the app and leave the screen as it is! This entry was posted in Haslemere first and tagged BBC Pandemic, Haslemere Museum, Haslemere Pandemic, HaslemereToday, Independent on October 14, 2017 by admin. THANK YOU to everyone who voted for Nikki and Maria. Congratulations to Simon Dear. This entry was posted in Election and tagged Haslemere, HaslemereToday, Independent on June 12, 2017 by admin. 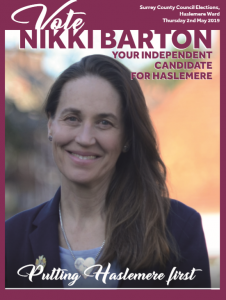 Nikki Barton will be standing as an independent candidate for the Haslemere South ward in the upcoming Haslemere Town Council by-election on 8th June. This entry was posted in Election and tagged Haslemere Town Council, Independent, Nikki Barton on June 1, 2017 by admin. Maria Mateo will be standing as an independent candidate for the Haslemere South ward in the upcoming Haslemere Town Council by-election on 8th June. My name is Maria Mateo and I moved to Haslemere in 2007 with my young family. I have 3 boys. Before I moved to Haslemere, I worked in The City as a solicitor. I started volunteering for Citizens Advice in Haslemere in 2009. I’ve also been a driver for the Orchard Club and I’ve been involved with the charity, Haslemere First Respondents. I’ve also been involved with a number of the sports clubs through my children – rugby, football, cricket. I was very actively in the campaign against the parking metres in Haslemere. I think it is important to listen to the residents and express their views in the town council because some residents don’t feel they’re listened to. I think it is also important to report to the residents and be open and transparent about everything that is going on in the town council. This entry was posted in Election and tagged Election, Haslemere Town Council, Independent, Maria Mateo on May 27, 2017 by admin.